runjoey: Looking back at the 1st half of 2017. Looking back at the 1st half of 2017. This is probably the most disappointing 6 months review since I began the blog back in 2006 and even more so considering what an amazing year in 2016. But stuff happens and I've learned how to roll with it and look ahead. But this is a review post so here goes. It's short. I had planned to begin the year by sneaking back into Ultras for a little bit the first week of January but the race was cancelled due to snow and ice storm, It was just as well because I had not really prepared well for it with no long runs other than the Kiawah Marathon a few weeks earlier and my heart wasn't really into it. Cancelling the 50k allowed me to focus on what I was in great shape for and that was the Run For The Roses 5k. 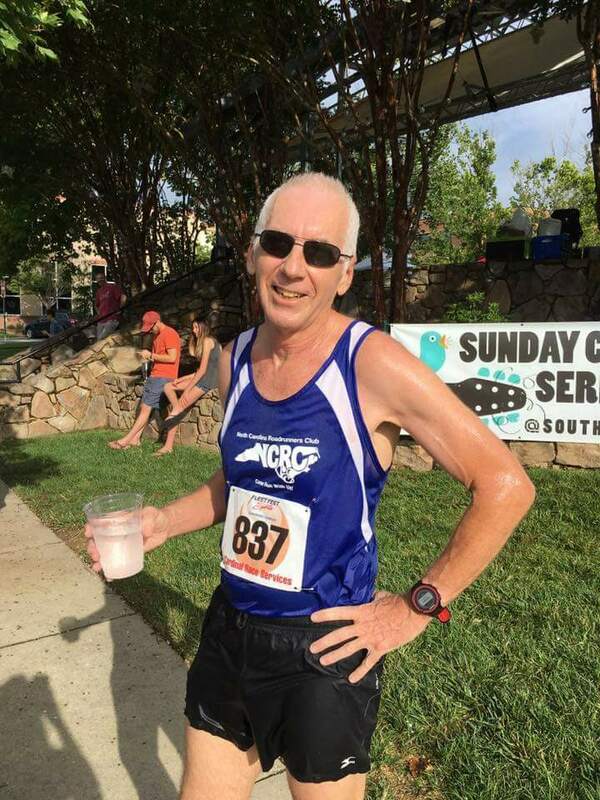 The race went well despite the unseasonably hot 80F and the hilly course and I was able to get my 3rd RRCA State Championship for Senior Grandmasters. Then about 9 days later it all fell apart when I had to bail on a workout with what turned out to be a stress fracture of my right heel. Ironically it was not running that initiated the injury but continuing to run and hope the pain would go away did it and me in. March and April were total washouts with no running and lots of pain. Finally on May 20th I felt like a test run. I tried one mile and it was pain free so I was able to begin to ease back into running again. On the 3rd of June, just 2 weeks after I started back I decided to go ahead and run the Rocky Mount Mills 5k that I had entered well before the injury. I just wanted to be careful and not hurt myself and get an idea at just how much conditioning I had lost. It was much cooler and drier than last year and I ran a lot better than I could have expected in 25:04, almost exactly 2 minutes slower than 2016 but I was very happy to run that well. 3 weeks later I went to Chapel Hill to run the Vegfest 5k for fun. The only reason I entered was because Laura and Susan's new yoga studio was sponsoring the awards and I thought it would be fun to race and spend some time hanging around at the booth at the festival. Wow ! I knew it would be hilly but it turned out to be the toughest 5k I have ever raced in my 40 years at this sport with nearly 300 ft of elevation gain ! And it was hot and 100% humid. I ran 26:12 which included an extra 10th of a mile thanks to the lead bike leading us front runners off course in the first 1/4 mile and then we had to weave our way through the entire field to get back up front. Grrrr. with the extra distance and hills and humidity I think my effort was definitely better than three weeks earlier. It wasn't a very competitive field and I finished 6th overall out of about 100 finishers. The best thing was Laura's daughter Isabella won the race overall for men and women and Sophia was running well in the top 4th of the pack but was led off course near the 2 mile mark. Julian was there to cheer for us and take pictures and its always the best to have Laura cheering me at the finish. So that's about it. I've already had to cancel the first race I had planned for July because it was the Grandfather Mountain Marathon and no way I'm ready for that tough course yet and only a 10 mile training run so far. I'll have a post looking ahead to the next 6 months up very soon I hope. Throughout the whole year so far I have done more yoga than ever before which has helped tremendously with keeping me in good shape. I really kicked it up a notch in June when Raleigh Yoga Company opened up for business May 28th. It is so much more convenient for me and so awesome to get to workout there nearly everyday and some days 2 or 3 times ! That's it for now. Stay tuned for what I am sure is going to be a much better and more exciting 2nd half of 2017. Training update 7-30-17. And moving on. Ready to race the Scream Half Marathon !